WhiteWash take home whitening gels – professional strength whitening treatments that can only be prescribed by a dentist. Using peroxide at the strengths permitted by dentists will whiten teeth beyond just removing surface staining which is what on the shelf whitening toothpastes will do. The treatment involves two visits to the practice. 1) The first appointment involves meeting the dentist and having impressions of your teeth taken for custom made bleaching trays. Discuss at this stage with your dentist whether you would prefer to wear your trays over night or during the day. Decide what feels right for you and what would fit best with your lifestyle. 2) A week or so later you will return to the practice to collect the whitening products and custom made trays, you will receive advice on how to use the products. WhiteWash teeth whitening will be presented to you in a luxury box with four syringes of whitening gel and a case for you to keep your whitening trays in as well as four precision applicator tips to ensure correct dosage of gel is used. WhiteWash gels are formulated and developed by UK dentists to ensure you will get not just a white smile, but a healthy, white smile! 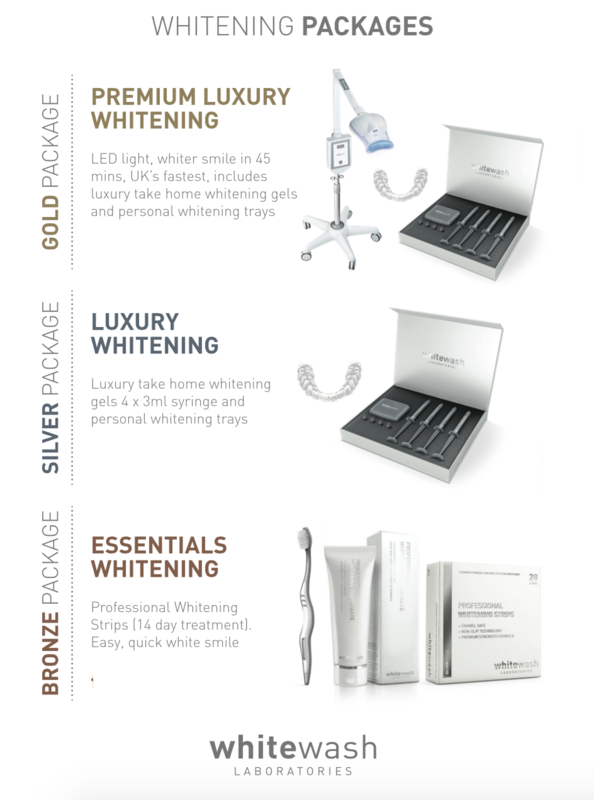 Average RRP £199-250 for take home whitening, enquire with your dentist for the cost of each package below.